For some business professionals, carrying a laptop, textbooks and big piles of paperwork is the norm. So it is only natural that a big briefcase with lots of space and compartments is necessary. Fortunately, there are briefcase bags for this purpose. The Samsonite Classic Three Gusset Toploader, which will become an essential item for those that are after a big briefcase geared towards laptop carriers. 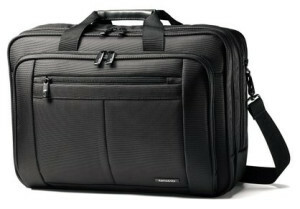 Read on in my review to find out how this laptop briefcase weighs up against others. Dimensions (inches) 17" x 12.5" x 6.5"
At the first glance, the Samsonite Classic Three Gusset Toploader Laptop Bag doesn’t appear eye catching and even looks to be too big. However, when you actually go to hold this briefcase, you will find that it is of a reasonable size and feels quite light too. After a while, you’ll realize that this briefcase is suitable for work, casual events and trips because of its simple style and many compartments. It does seem a little too big to be deemed suitable for formal use within a corporate environment though. The material is made with ballistic weave nylon (same as the Samsonite Classic Two Gusset model) which is well known for its durability and toughness. Unfortunately, the outer edges that frame the briefcase are not pipe lined with a hard material to create a solid frame. However, the briefcase does still keep its shape when filled but not when it’s overfilled where it will bulge and cause the briefcase to fall over when set down. It doesn’t look as good anymore either. 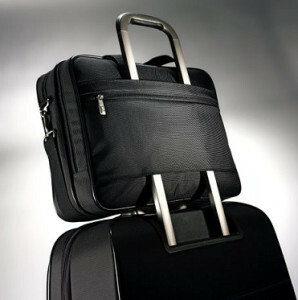 The metal zips on the briefcase are of a matt black finish and embossed with the Samsonite logo. It doesn’t look like the black on the zips will chip though and this hasn’t happened to anyone so I would imagine it to be chip resistant. As the briefcase only comes in black, the zips go nicely with the black briefcase giving it a simple stylish look. There are no holes on the zips that allow you to fit a padlock on though. This laptop briefcase also has an open sleeve on the back of the briefcase which can be fitted over the telescopic handle of your suitcase making it easier to carry when traveling. The Samsonite Classic Three Gusset Toploader has a padded shoulder strap which is adjustable and can be carried on the shoulder or across the body. Some users have found it more comfortable to carry across the body as the weight is distributed evenly and it is not as awkward to carry this way due to its big size. Carrying it on the shoulder is a bit of a nuisance as it tends to constantly knock against your leg or you have people knocking into your briefcase. There is also a carry handle which is padded with a soft leather material. However, some users have found that the it’s not as comfortable to hold by the carry handle as it is made shorter than usual (perhaps due to the extra compartment). One of the best things about this briefcase is the compartments! The Samsonite Classic Three Gusset Toploader has exactly the same compartments as their Two Gusset model, except that this has 3 main compartments and the front pocket is larger. The front main compartment has a mesh zipped pocket stitched to the side and it is spacious enough to fit a full ring binder in. The zips go down to ¾ of the way. The middle compartment is where your laptop goes. It is separated inside with a divider and there is padding with a Velcro strap attached to secure your laptop and the other side has 3 double stitched pockets for your laptop accessories. Being in the middle compartment gives your laptop more padding so it is more protected. The rear main compartment is also separated with a divider inside and is quite spacious. The large front pocket of the briefcase has stitched pockets for your phone, pens, cards and a small zipped pocket. 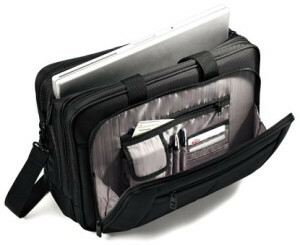 The zips go all the way which gives it more space to fit a thin file. The other front pocket is smaller and centered which is good for storing easy access items. The back of the briefcase also has a large zipped compartment on the open sleeve. It is thin so would only fit thin files or paperwork. With the Samsonite Classic Three Gusset Toploader Laptop Bag, it is quite large so it would be ideal for someone who often carries ring binders or thick folders to and from work. However, due to this size, it seems better suited for casual work environments. I particularly recommend this to people who work in IT or who usually have to travel around as many have found this briefcase to be just the right size. It works very well for short business trips as it’s cabin friendly. It’s recommended not to overfill the briefcase as it will cause bulging in the compartments. It causes the briefcase to look less professional and more importantly, may also damage the zipper which has happened to a few users. As with all Samsonite products though, there is a 3 year worldwide warranty. However, if you want something a bit slimmer but still want to retain more or less the same attributes of this bag, then you may want to check out the Samsonite Classic Two Gusset Toploader instead.